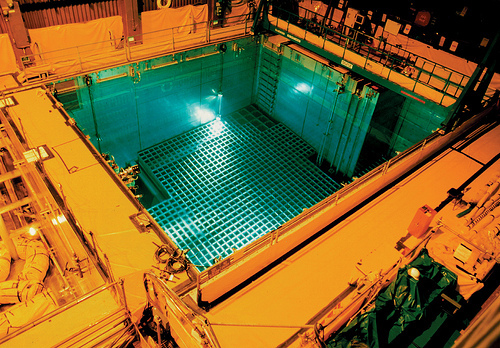 The US Nuclear Regulatory Commission announced Tuesday it would suspend the issuing of new reactor operating licenses, license renewals and construction licenses until the agency crafted a plan for dealing with the nation’s growing spent nuclear fuel crisis. The action comes in response to a June ruling by the US Court of Appeals that found the NRC’s “Waste Confidence Decision”–the methodology used to evaluate the dangers of nuclear waste storage–was wholly inadequate and posed a danger to public health and the environment. Prior to the court’s ruling, the Commission had evaluated licensing and relicensing with the assumption that spent fuel–currently stored on site at nuclear power plants in pools and dry casks–would soon be moved to a central long-term waste repository. As previously noted, that option was once thought to be Yucca Mountain, but after years of preliminary work and tens of millions of dollars wasted, Yucca was found to be a poor choice, and the Obama Department of Energy and the NRC ended the project. The confirmation of new NRC Chair Allison Macfarlane–considered a nuclear waste expert and on record as a Yucca Mountain critic–focused even more attention on the country’s lack of realistic plans for safe, permanent waste storage. 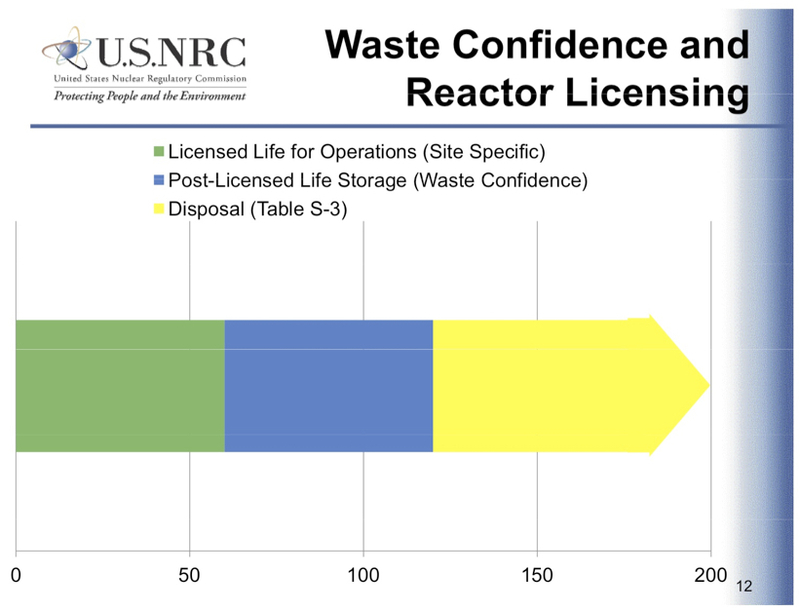 Waste confidence undergirds certain agency licensing decisions, in particular new reactor licensing and reactor license renewal. Because of the recent court ruling striking down our current waste confidence provisions, we are now considering all available options for resolving the waste confidence issue, which could include generic or site-specific NRC actions, or some combination of both. We have not yet determined a course of action. In recognition of our duties under the law, we will not issue licenses dependent upon the Waste Confidence Decision or the Temporary Storage Rule until the court’s remand is appropriately addressed. Still, this should be read as a victory for the originators of the suit that resulted in the June ruling–the Attorneys General of Connecticut, New Jersey, New York and Vermont in coordination with the Prairie Island Indian Community of Minnesota and environmental groups represented by the National Resources Defense Council–and most certainly for the millions of Americans that live close to nuclear plants and their large, overstuffed, under-regulated pools of dangerous nuclear waste. Complainants not only won the freeze on licensing, the NRC guaranteed that any new generic waste rule would be open to public comment and environmental assessment or environmental impact studies, and that site-specific cases would be subject to a minimum 60-day consideration period. While there is still plenty of gray area in that guarantee, the NRC has (under pressure) made the process more transparent than most similar dealings at the agency. The commission has also, at least for the moment, formally acknowledged that the nation’s nuclear reactor fleet faces a very pressing problem. The US has 72,000 tons of radioactive waste and generates an additional 2,000 tons every year. Spent fuel pools at individual sites are already so full they pose numerous threats, some eerily similar to the ongoing disaster at Fukushima. 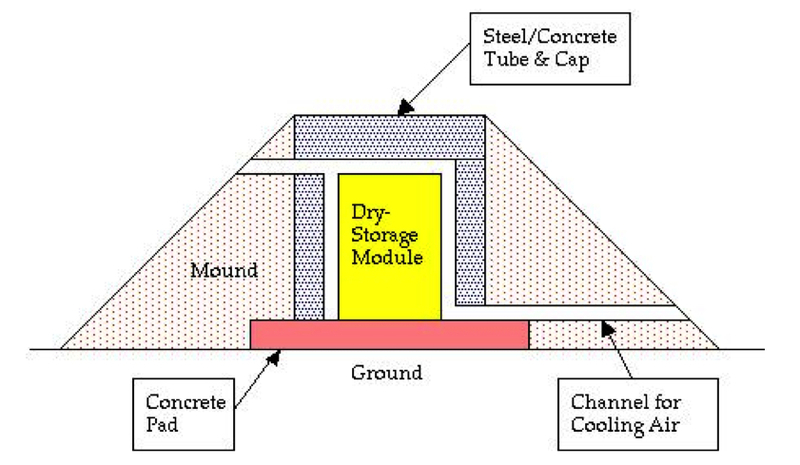 Dry cask storage poses other problems and much additional expense. And regional interim waste storage facilities, an idea possibly favored by Macfarlane, is problematic for many reasons, not the least of which is that no sites have yet been designated or built. But nuclear plant operators, already burdened by the spiraling costs of a poorly maintained and aging inventory, are desperate to have the federal government take the waste problem off their backs–and off their books. Whether that is even technically feasible, let alone politically of fiscally possible, remains to be seen. But the NRC has at least recognized–or at least been forced to recognize–that the nuclear industry should not be allowed to create waste indefinitely without a plan to safely secure what is already on hand. Outgoing NRC Chmn. 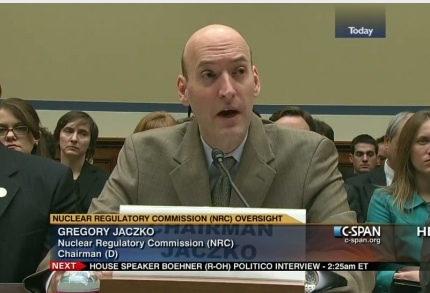 Jaczko testified before the House Committee on Oversight and Government Reform last year. The Chairman of the Nuclear Regulatory Commission, Gregory Jaczko, submitted his resignation Monday morning. Chairman Jaczko, a former aid to Senator Harry Reid (D-NV) and Representative Ed Markey (D-MA) who holds a PhD in particle physics, was originally appointed to the NRC in 2005, and elevated to chairman in 2009. Jaczko said he will relinquish his post upon confirmation of a replacement. Jaczko’s announcement is hard to separate from pressing questions about the safety of commercial nuclear power in the United States–especially in the context of the ongoing crisis in Japan–the debate over the future of the Yucca Mountain nuclear waste repository, signs of shifting power dynamics in Washington, and, perhaps most importantly, the influence of wealthy and well-connected private industry on public policy. As has been discussed here before, Greg Jaczko has been at the center of an orchestrated controversy for much of the last year, with nuclear industry lobbyists, Republican members of Congress, and other NRC commissioners pressing for the chairman’s ouster. Representative Darrell Issa (R-CA), head of the House Committee on Oversight and Government Reform, has been an especially dogged critic of Jaczko, holding hours of hearings and serving as the driving force behind two inspector general reports on the allegedly hostile workplace environment at the NRC. Issa, it must be noted, represents a district that includes the extremely troubled San Onofre Nuclear Generating Station (SONGS). The plant is currently offline as regulators try to determine the root causes of radiation leaks and rapid degradation of copper tubing used to move radioactive steam in and out of the reactors. The Orange County Republican has received copious campaign contributions from the companies that operate and maintain San Onofre. Issa called hearings (while calling for Jaczko’s head) last year after the four other commissioners made public their letter to the White House complaining about Jaczko’s managerial style. The complaint revolved around a handful of issues that help explain the apparent urgency behind the anti-Jaczko putsch. First, critics were upset about the way that Jaczko helped end work on the Yucca Mountain nuclear storage site. Yucca had proven problematic for a number of reasons–environmental, economic, security, and social–and had long been the target of Nevada politicians (most notably, Senate Majority Leader Reid), who felt their state had been dealt with unfairly in the original selection process. The Obama administration had seemed to agree, and had the Department of Energy withdraw a request for the licensing of Yucca Mountain. In addition, very little money remained in Yucca’s budget, and no more has been approved. But the nuclear industry desperately needs an answer to the problem (crisis, really) of long-term nuclear waste storage, and Yucca Mountain is the only site that has even been started. (It is nowhere near finished.) Without a place to move “spent” fuel and the other dangerous detritus of the process, nuclear power cannot realistically expand the number of rectors in the US, nor can it long continue to maintain and refuel those already in operation. The nuclear industry, through its proxies in Congress and on the NRC, has complained that Jaczko didn’t allow advocates for Yucca to perpetuate the process. Most recently, a fight went public when President Obama nominated NRC Commissioner Kristine Svinicki for another term over the vocal objections of Senator Reid and his colleague Barbara Boxer (D-CA). Of special contention, the role Svinicki played in drafting the documents that called for the construction of the Yucca repository. In the wake of the initial accident, Jaczko sought recommendations for US nuclear safety. The Near-Term Task Force (NTTF) Review of Insights from the Fukushima Dai-Ichi Accident produced a collection of basic (and, as discussed here, rather weak) recommendations last summer. Chairman Jaczko tried to start the process of turning those recommendations into rules–a process that could stretch beyond five years–but met objections from each of the other four commissioners. Jaczko also wanted lessons learned from Fukushima included in construction and licensing permits granted to four AP1000 reactors (two to be built in Georgia, two in South Carolina), but the chairman was outvoted four-to-one by his fellow NRC members. The third (and most often referenced) complaint fired at Jaczko was that he had created a “hostile work environment,” especially for women. Though Svinicki, the only woman on the commission, lamented Jaczko’s tone, the specific “charge” (if it can be called that) was brought by Commissioner William Magwood. Magwood said there were female staffers that Jaczko had brought to tears, though none of those women personally came forward (because, it was said last year, they did not want to relive the humiliation). The story gained extra prominence when Senate Minority Leader Mitch McConnell (R-KY; Kentucky, by the way, home to a nuclear waste nightmare called Paducah) attempted to use this alleged incident to disrupt the rising narrative of the Republican “war on women.” McConnell and others from his side of the aisle took to the microphones to denounce the administration’s treatment of whistleblowers and praise the apparently brave and much put-upon Svinicki. In what seems to be a rare case where the public’s relative lack of interest in nuclear regulation can be called a positive, McConnell’s gambit failed. . . But when it came to serving the nuclear industry, McConnell’s contribution to the ouster of Jaczko will likely be rewarded. . . with industry contributions of the monetary kind. Chairman Jaczko’s resignation comes just before issues of his workplace demeanor would likely again dominate headlines (if, again, any story regarding nuclear regulation can be imagined to dominate this year’s headlines), as a second IG report on the NRC work environment is due next month, and Issa had already promised more hearings. But Jaczko’s announcement would likely not have come without the intervention or, at least, tacit blessing of Senator Reid. As mentioned, Reid has been Jaczko’s best friend on the Hill, and Jaczko has helped Reid and the Obama administration move away from making Nevada the final resting place for a country’s worth of hazardous nuclear waste. After President Obama defied Reid’s private and public requests, and nominated Kristine Svinicki for another term as NRC commissioner, the Senator had a choice to make–and some political calculations to do. While, to the nuclear industry, Jaczko represented an insufficiently pliant regulator–be it concerning NTTF recommendations, fire safety rules, or waste storage–to Harry Reid, the NRC chairman is most importantly a staunch opponent of the Yucca project. And Jaczko is the only one of the five NRC commissioners who meets that description. With Jaczko’s public image under attack and his ability to function as chairman challenged by the other commissioners and nuclear-friendly forces in Congress, questions of how much longer he could survive would have continued throughout the year. With that baggage, and with Senator Reid’s Democratic majority and possibly even his leadership position up in the air come November, there seems little chance that Obama would have shown Jaczko the same deference he did Svinicki and offered to nominate him for another term when the chairman’s current one expired in 2013. As it is custom for NRC commissioners to be nominated in pairs–one from the Democrats, one from the Republicans–to smooth their paths to confirmation, Reid likely looked at Jaczko’s predicament, Svinicki’s nomination, and his own future and saw this as a moment to make some lemonade out of a crate of rotting lemons. Act now, and Reid would play a prominent role in choosing Jaczko’s replacement–who could theoretically get confirmed alongside Svinicki for a full, five-year term–wait, continue to back Jaczko and fight the administration and the GOP on Svinicki, and the best Reid could hope for is a year of controversy over NRC personnel and an uncertain amount of influence in shaping the future of the Nuclear Regulatory Commission. Indeed, current reporting is that the White House will move quickly to nominate Jaczko’s replacement (and rumors are it will be a woman), and that the administration is in consultation with Reid to choose someone he will help move through the Senate confirmation process. It is hard to believe Reid will look kindly upon any nominee interested in re-starting the Yucca Mountain process. It is said that, in life, timing is everything. In politics, money probably keeps timing from cornering the be-all-end-all market, but timing has played a part in the NRC’s saga. As Reid hopes to use this moment to keep his objectives on course, the nuclear industry is trying to desperately to turn back time to an era where the term “nuclear renaissance” wasn’t said with a smirk and a glance eastward toward Japan. As with Yucca Mountain, where atom-loving electeds and regulators scramble to get the federal government to take their waste–with its risks and expense–off of the nuclear industry’s hands, the threat of new safety rules (and their perceived expense) emerging from the post-Fukushima review also motivated a profit-centric industry to step up their efforts to remake the NRC in their own image. [T]hough the commissioners’ complaint was written and delivered to the White House in October, it was only made public by Rep. Issa last Friday. A slot usually reserved for news dumps seems like bad timing if Issa and his allies wanted to create a splash, unless you consider that Rep. Ed Markey (D-MA) had planned to release a report on Monday showing how NRC commissioners had coordinated with pro-nuclear legislators to slow or stop post-Fukushima safety reforms. Markey’s report (PDF) includes emails revealing commissioner Magwood and staffers for pro-nuclear Sen. James Inhofe (R-OK) worked together to discredit Jaczko for taking the lead on the US regulatory response to Fukushima. And as reported in October, this behavior was not new for Magwood. During his time at the Department of Energy, Magwood held private meetings with top nuclear industry lobbyist Marvin Fertel. In December, Ryan Grim of The Huffington Post detailed–in a scenario eerily similar to what culminated this week–how Magwood and his industry friends worked behind the scenes to oust his superior at DoE. It also deserves mentioning that between his time in the George W. Bush Energy Department and his appointment to the NRC by President Obama, Magwood formed the consulting firm Advanced Energy Strategies, whose clients included not only TEPCO, the nominal owner of Fukushima Daiichi (until the Japanese government finishes its bailout/buyout), but a veritable who’s who of the Japanese nuclear elite. 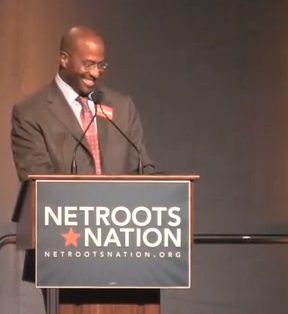 As discussed above, Jaczko was the only NRC commissioner who voted to include future post-Fukushima rules in the licensing requirements for new reactors in Georgia and South Carolina. Both those projects are still wanting for full financing, and Georgia’s reactors are already behind schedule and, as revealed recently, nearly $1 billion over budget. The last thing the industry wants to see are demands for pricy safety upgrades or reminders of all that can go wrong at a nuclear plant. Jaczko’s desire for inclusion of Fukushima “lessons learned” held out a threat (however weak) of both. But it was the rather weak recommendations, the glacial pace of change, and the seemingly futile lone votes against four other commissioners in the nuclear industry’s hip pocket that also helped end Jaczko’s run as NRC chair. Theoretically, election cycles are when elected officials are most responsive to public pressure, but what part of the public felt particularly compelled to fight on Jaczko’s behalf? 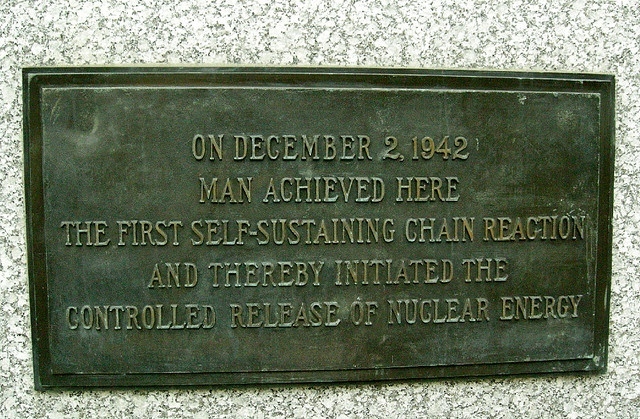 As stated during an earlier act in this power play, the nuclear industry and its acolytes were never going to see Jaczko as anything but the enemy, but the chairman’s “moderate” response to the Fukushima moment, along with the continued granting of license extensions to aging nuclear plants, and his oft-repeated statements of faith in the broken regulatory process left Jaczko with no strong allies in the anti-nuclear movement. Between the ongoing Fukushima disaster and the dynamics of an election year, the timing could have been favorable for a regulator bold enough to dare to regulate. Instead, Chairman Jaczko, who no doubt saw his split-the-middle path as a reasonable one, was left alone to watch as his colleague, Bill Magwood, helped orchestrate a coup, and as his benefactor, Harry Reid, moved to cut his losses. For America, however, losses have not been cut–nuclear power is still a perpetual economic sinkhole and a looming ecological disaster–and no matter how the politicians try to massage the regulatory process, the science that makes nuclear power so untenable remains constant. Constant, too, is the global trend–most of the industrialized world is turning away from this dirty, dangerous, and exorbitantly expensive way to boil water. Jaczko’s chairmanship of the Nuclear Regulatory Commission may be at its dénouement, but that does nothing to magically create a nuclear renaissance. The good and bad news here is that all of nuclear power’s problems are just as real and just as pressing, with or without Greg Jaczko. One year on, perhaps the most surprising thing about the Fukushima crisis is that nothing is really that surprising. Almost every problem encountered was at some point foreseen, almost everything that went wrong was previously discussed, and almost every system that failed was predicted to fail, sometimes decades earlier. Not all by one person, obviously, not all at one time or in one place, but if there is anything to be gleaned from sorting through the multiple reports now being released to commemorate the first anniversary of the Tohoku earthquake and tsunami–and the start of the crisis at Fukushima Daiichi–it is that, while there is much still to be learned, we already know what is to be done. . . because we knew it all before the disaster began. Why were preparations for a nuclear accident so inadequate? 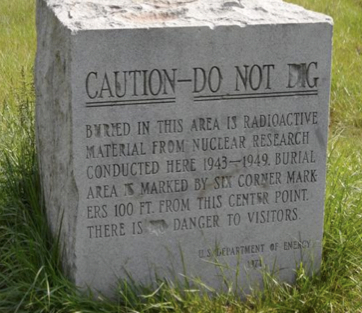 One factor was a twisted myth–a belief in the “absolute safety” of nuclear power. 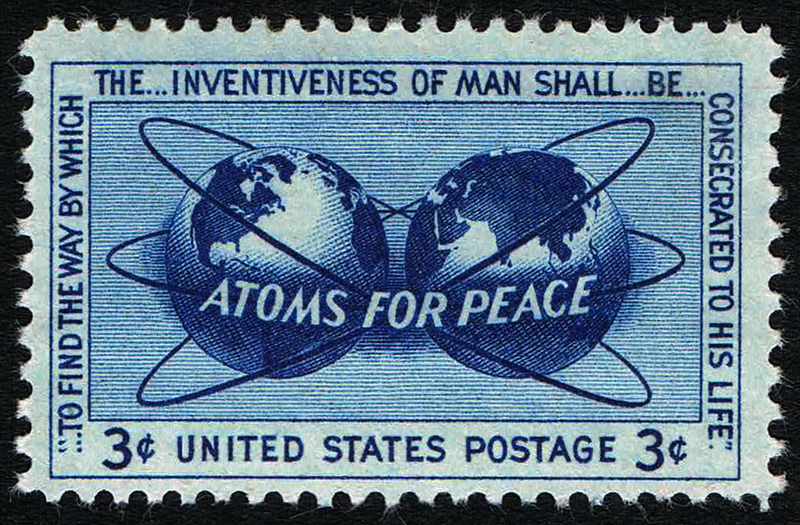 This myth has been propagated by interest groups seeking to gain broad acceptance for nuclear power: A public relations effort on behalf of the absolute safety of nuclear power was deemed necessary to overcome the strong anti-nuclear sentiments connected to the atomic bombings of Hiroshima and Nagasaki. Since the 1970s, disaster risk has been deliberately downplayed by what has been called Japan’s nuclear mura (“village” or “community”)–that is, nuclear advocates in industry, government, and academia, along with local leaders hoping to have nuclear power plants built in their municipalities. The mura has feared that if the risks related to nuclear energy were publicly acknowledged, citizens would demand that plants be shut down until the risks were removed. Japan’s nuclear community has also feared that preparation for a nuclear accident would in itself become a source of anxiety for people living near the plants. The word used then to describe risks that would cause unnecessary public anxiety and misunderstanding was “unanticipated.” Significantly, TEPCO has been using this very word to describe the height of the March 11 tsunami that cut off primary and backup power to Fukushima Daiichi. Ignoring for this moment the debate about what cut off primary power, the idea that the massive size of the tsunami–not to mention what it would do to the nuclear plant–was unanticipated is, as this paper observes, absurd. Studies of a 9th Century tsunami, as well as an internal report by TEPCO’s own nuclear energy division, showed there was a definite risk of large tsunamis at Fukushima. TEPCO dismissed these warnings as “academic.” The Japanese government, too, while recommending nuclear facilities consider these findings, did not mandate any changes. Instead, both the industry and the government chose to perpetuate the “safety myth,” fearing that any admission of a need to improve or retrofit safety systems would result in “undue anxiety”–and, more importantly, public pressure to make costly changes. “No one could have possibly anticipated. . .” is not just the infamous Bush administration take on the attacks of 9/11/2001, it has become the format for many of the current excuses on why a disaster like Fukushima could happen once, and why little need now be done to make sure it doesn’t happen again. In fact, reading the BAS Fukushima review, it is dishearteningly easy to imagine you are reading about the state of the American nuclear reactor fleet. Swapping in places like Three Mile Island, Palisades, Browns Ferry, Davis-Besse, San Onofre, Diablo Canyon, Vermont Yankee, and Indian Point for the assorted Japanese nuclear power plants is far too easy, and replacing the names of the much-maligned Japanese regulatory agencies with “Nuclear Regulatory Commission” and “Department of Energy” is easier still. As observed a number of times over the last year, because of unusual events and full-on disasters at many of the aging nuclear plants in the US, American regulators have a pretty good idea of what can go wrong–and they have even made some attempts to suggest measures should be taken to prevent similar events in the future. But industry pressure has kept those suggestions to a minimum, and the cozy relationship between regulators and the regulated has diluted and dragged out many mandates to the point where they serve more as propaganda than prophylaxis. Mythical, too, is the notion that the federal government has the regulatory infrastructure or political functionality to make any segment of that tripartite lie ring closer to true. From NRC chairman Gregory Jaczko’s bizarre faith in a body that has failed to act on his pre-Fukushima initiatives while actively conspiring to oust him, to the Union of Concerned Scientists’ assuming a regulatory “can opener,” the US may have a bigger problem than the absolute safety myth, and that would be the myth of a government with the will or ability to assure that safety. Which, of course, is more than a shame–it’s a crime. With so many obvious flaws in the technology–from the costs of mining, importing and refining fuel to the costs of building an maintaining reactors, from the crisis in spent fuel storage to the “near misses” and looming disasters at aging facilities–with so many other industrialized nations now choosing to phase out nuclear and ramp up renewables, and with the lessons of Fukushima now so loud and clear, the path forward for the US should not be difficult to delineate. Nuclear power is too dirty, too dangerous and too expensive to justify any longer. No one in America should assume that the willpower or wherewithal to manage these problems would magically appear when nothing sufficient has materialized in the last fifty years. Leaders should not mistake luck for efficacy, nor should they pretend birds of a feather are unrelated black swans. They know better, and they knew all they needed to know long before last year’s triple meltdown. Nuclear is not in a “renaissance,” it is in its death throes. Now is the time to cut financial losses and guard against more precious ones. The federal government should take the $54.5 billion it pledged to the nuclear industry and use it instead to increase efficiency, conservation, and non-fissile/non-fossil energy innovation. Compare and contrast this 25-minute video from Al Jazeera and the Center for Investigative Reporting with what you read in the Bulletin of the Atomic Scientists report mentioned above. For that matter, contrast it with the two longer but somehow less rigorous videos from Frontline, which were discussed here and here. Also, there are events all over the globe this weekend to commemorate the first anniversary of the Tohoku earthquake and the nuclear crisis it triggered. To find an event in your area, see this list from Beyond Nuclear and the Freeze our Fukushimas Campaign.